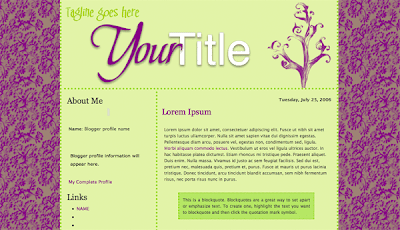 Custom pre-made templates for a Blogger/Blogspot blog. Customized with your blog title, (optional) tagline, (optional) profile photo, RSS feed buttons for your site, and signature. Price includes installation. These templates will only be sold once. Click the images for order information. Hi! I understand that you will not be taking orders until January 1st but I was hoping I could be put on your waiting list (if you have one). I am interested in the Professional Blog/Website plus installation option. Can you please email me and let me know how long you estimate it will take to complete a Professional Blog/Website from start to finish? I would also like to be put on your waiting list if you have one. Not quite sure which type of installation I would need. I have a list of things I could give you to give you an idea of what I'm looking for. I am just wondering how long it takes to complete the site. Looks like it's going to be a busy 2008 :) Your work is beautiful. I would like to get on the waiting list as well. I am looking for the website style layout. Whenever you have time you can email any information you need along with the new rates if you have those and I am happy to put down a deposit 50% or whatever to hold my spot. I love your designs and definitely want to be on the waiting list for 2008 for a blog makeover. joining the waiting list also, please! Your work is amazing! Can't wait! Please send me your email address or download the new customer questionnaire from the ordering page and send it to me. Hello, my name is Glorie. I am deaf. I would love create my deaf blog site. I am wondering if you can make pre template. I love your site , your any design. You did very wonderful job. How exciting to see how your business is growing. I, too, would like to be placed on your waiting list.